The timeless beauty and tradition of Irish Lace teams with the fluidity of Tunisian crochet to create a garment you’ll want to wear year-round. 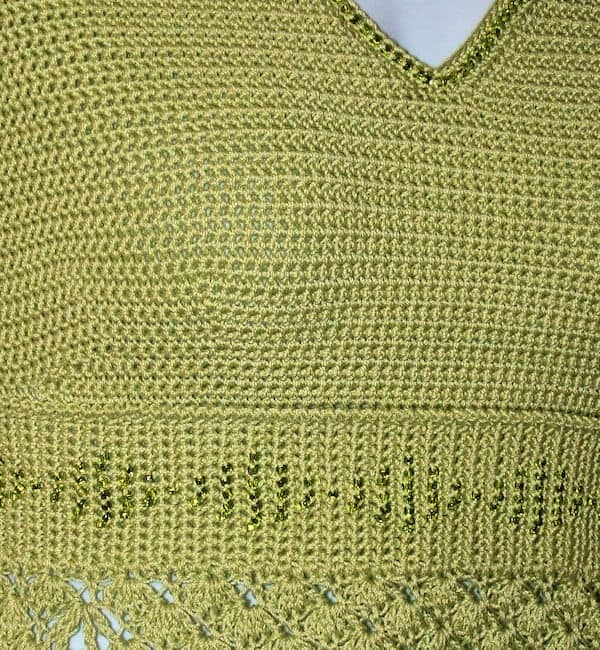 Note: This design was originally published in Interweave Crochet, Summer 2011. Through contract with the publisher, I am publishing it on my website. If you prefer an ad-free download, please visit the Interweave website HERE. Ease is 0” at bust. Garment will stretch slightly. 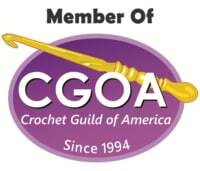 Size 7 (1.5mm) steel hook, size L/11 (8mm) afghan hook (circular hook with minimum of 12” cable extension recommended) and size H/8 (5mm) regular crochet hook. Adjust hook sizes if necessary to obtain correct gauge. Center Back Motif: after rnd 11, 4.5” across; after rnd 25, 9.5”. 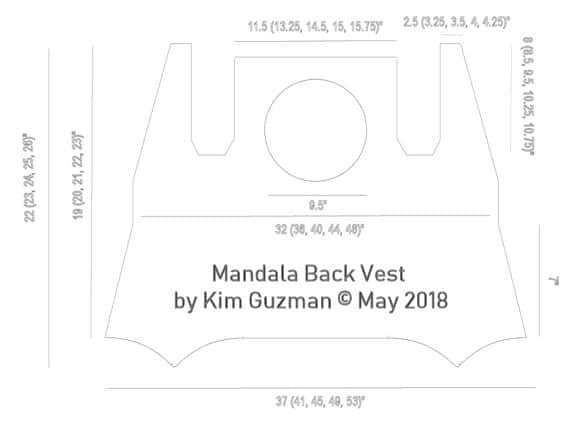 Since this piece must fit into a specific opening in the back of the garment, it is very important to check after rnd 11 to ensure that gauge is being met. The tension here is quite tight, so use a hook that will allow you to meet the measurements stated. 12 sts and 13 rows = 4” in tks with afghan hook. The garment begins by making the Circle Back Motif and setting aside. Using a provisional cast on, the garment body is worked from waist down, then the provisional chain is removed and the bodice is worked from waist to shoulder. Shoulders are seamed and Circle Back Motif is sewn to the upper Back. Button band created by picking up loops along inner edges and back neck, then armhole finishing in regular crochet. When beginning each Tunisian crochet row, skip the first stitch (unless otherwise indicated) before pulling up lps. The lp on the hook counts as the first st. When closing each Tunisian crochet row, unless otherwise indicated: ch 1, [yo, pull through 2 lps] across. Rnd 1: With A and steel hook, ch 8, sl st to first ch to form a ring, ch 1, 16 sc in ring, sl st to first sc. Rnd 2: Ch 1, [sc in sc, 2 sc in next sc] around, sl st to first sc—24 sc. Rnd 3: Ch 4 (counts as dc, plus ch-1), [dc in next sc, ch 1] around, sl st to 3rd ch of beg ch-4—24 dc and 24 ch-1 sps. Rnd 4: Ch 1, sc in same ch as joining, in each ch-1 sp and in each dc around, sl st to FL only of first sc—48 sc. Rnd 5: Ch 1, sc in FL only of same sc as joining, [ch 3, sk 3 sc, sc in FL only of next sc] around, ch 3, sl st to first sc—12 ch-3 sps. Rnd 6: Sl st into first ch-3 sp, ch 1, [sc, hdc, 3 dc, hdc, sc] in each ch-3 sp around, sl st to first sc. Rnd 7: Ch 1, working behind rnds 5-6, sl st into unused BL of first sc of rnd 4, rep rnd 5, working in BL only of previously-worked sc. Rnd 9: Working behind rnds 5-8, sl st to 2nd of 3 skipped sc on rnd 4, * ch 17, tr in 6th ch from hook, [ch 1, sk 1 ch, tr in next ch] 4 times, ch 1, sk 1 ch, hdc in next ch, (1 ch remains), sl st in next 2nd skipped sc from rnd 4 (Petal made), rep from *11 times more, ending with sl st into same st as joining—12 Petals. Rnd 10: Sl st into ch-1 sp, ch 1, *sc in ch-1 sp, sc in each rem ch-1 sp and each unworked lp of st to ch-5 sp at top of Petal, 7 sc in ch-5 sp, sc in each st and ch-1 sp on opposite side of Petal, sk hdc at base of Petal—27 sc, rep from *for each rem Petal, sl st to first sc. Rnd 11: Sl st into next sc, ch 1, *10 sc, 3 sc in next sc, 5 sc, 3 sc in next sc, 10 sc, sk next 2 sc, rep from * around each Petal, sl st to first sc, cut off. Rnd 12: Join A with sl st to any 2nd sc of second 3-sc corner of any Petal, ch 1, *sc in 2nd sc of 3-sc corner of Petal, ch 5, sc in 2nd sc of 3-sc corner of next Petal, ch 7, rep from * around, sl st to first sc. Note: The ch-5 sps are between the Petals. The ch-7 sps are at the tip of the Petal. It is important to start with a ch-5 sp. Rnd 13: Sl st into ch-5 sp, ch 1, *5 sc in ch-5 sp, [5 sc, picot, 5 sc] in ch-7 sp, rep from * around, sl st to first sc. Rnd 14: Ch 4 (counts as first tr), tr in same sc as joining, dc in each of next 3 sc, 2 tr in next sc, ch 2, *2 tr in next sc, tr in each of next 3 sc, 2 tr in next sc, ch 2, rep from * around, sl st to 4th ch of beg ch-4—12 7-tr groups. Rnd 15: Ch 5 (counts as first tr, plus ch 1), tr in same st as joining, ch 1, [tr in next tr, ch 1] 5 times, [tr, ch 1, tr] in next tr, *[tr, ch 1, tr] in next tr, ch 1, [tr in next tr, ch 1] 5 times, [tr, ch 1, tr] in next tr, rep from * around, sl st to 4th ch of beg ch-4—12 9-tr groups with 8 ch-1 sps in each group. Rnd 16: Ch 1, sc in each tr and ch-1 sp around, sl st to FL only of first sc—204 sc. Rnd 17: Rep rnd 5—51 ch-3 sps. Rnds 18-20: Rep rnds 6-8. Rnd 21: Working behind rnds 17-20, rep rnd 9—51 Petals. Rnds 22-23: Rep rnds 10-11. Rnd 24: Join A with sl st to any 2nd sc of first 3-sc corner of any Petal, ch 1, *sc in 2nd sc of 3-sc corner of Petal, ch 7, sc in 2nd sc of 3-sc corner of opposite side of Petal, ch 1, rep from * around, sl st to first sc. Note: The ch-1 sps are between the Petals. The ch-7 sps are at the tip of the Petal. It is important to start with a ch-7 sp. Rnd 25: Sl st into ch-7 sp, *5 sc in ch-7 sp, sk ch-1 sp, rep from * around, sl st to first sc—255 sc. Rnd 26: Ch 1, 2 sc in same sc as joining, *picot, sk 2 sc, 2 sc in next sc, rep from * to last 2 sc, picot, sk 2 sc, sl st to first sc, cut off—85 picot. Row 1: Provisional Cast-On: With B (or scrap yarn) and afghan hook, ch 106 (118, 130, 142, 154) loosely. Cut off. Sk 5 ch, pull up lps in back horizontal bar of 96 (108, 120, 132, 144) chs, leaving rem chs unworked. Close (see Notes). Row 2: Tks across, close—96 (108, 120, 132, 144) lps. Row 3: 11 (13, 14, 16, 17) tks [12 (14, 15, 17, 18) lps on hook], yo, tks to last 12 (14, 15, 17, 18) sts, yo, tks across, close—98 (110, 122, 134, 146) lps. Row 4: *Tks to yo, [yo, m1, yo], rep from * once more, tks across, close—102 (114, 126, 138, 150) lps. Row 5: *Tks to yo, [m1, yo, k1, yo, m1], rep from * once more, tks across, close—106 (118, 130, 142, 154) lps. Rows 6-20: Rep row 5. On final row, 166 (178, 190, 202, 214) lps. Row 21: *Tks to yo, m1, k1, m1, rep from * once more, tks across, close—166 (178, 190, 202, 214) lps. Row 22: [Tks, trs] to last st, tks, close. Row 23: [Trs, tks] to last st, tks, close. Row 24: Working as for tks, sl st across each st, cut off. Turn work to beg working in opposite direction from row 1. Carefully remove provisional chain and place all lps on afghan hook, close. Rows 1-7: Tks across, close—96 (108, 120, 132, 144) lps. Do not cut off. Row 1: Tks across 41 (47, 53, 59, 65), close, leaving rem sts unworked—42 (48, 54, 60, 66) lps. Row 2: Tks to last 2 sts, close, leaving rem sts unworked—40 (46, 52, 58, 64) lps. Rows 3-5: Rep row 2. On final row, 34 (40, 46, 52, 58) lps. Rows 6-7: Tks across, close. Do not cut off. Row 1: Work beg dec, 15 (18, 20, 23, 24) tks, work end dec, tks, close, leaving rem sts unworked—19 (22, 24, 27, 28) lps. Row 2: Work beg dec, tks to last 3 sts, work end dec, tks, close—17 (20, 22, 25, 26) lps. Row 3: Rep row 2—15 (18, 20, 23, 24) lps. Rows 4-5: Tks across, close. Row 6: Work beg dec, tks across, close—14 (17, 19, 22, 23) lps. For size 1X only, rep row 6—21 lps. Rep rows 4-6 six (seven, eight, nine, ten) times more—8 (10, 11, 12, 13) lps. Next 2 (2, 1, 0, 0) rows: Tks across, close. Next row: Working as for tks, sl st across each st, cut off. Row 1: Returning to rem 13 (16, 20, 23, 28) sts of first Center Back Motif shaping, pull up lp in first unworked st, working as for tks, sl st across 6 (6, 8, 10, 12) sts (1 lp rem on hook), work beg dec, tks across, close—6 (9, 11, 12, 15) lps. Row 2: Work beg dec, tks across, close—5 (8, 10, 11, 14) lps. For size 2X only, rep prev row 2 times more—12 lps. Next row: Tks across, close. Rep prev row 14 (14, 14, 14, 12) times more. Row 17: Tks to last 2 sts, [tfs, tks] 2 times, close—7(10, 12, 13, 14) lps. Rows 18-19: Rep row 17. On final row—11 (14, 16, 17, 18) lps. Row 20: Rep row 17, except do not close sts, place 13 (16, 18, 19, 20) unclosed lps on stitch holder, cut off. Row 1: Returning to rem 54 (60, 66, 72, 78) sts of first row of Center Back Motif shaping, pull up lp in first unworked st, working as for tks, sl st across 12 (12, 12, 12, 12) sts (1 lp rem on hook), tks across, close—42 (48, 54, 60, 66) lps. Row 2: Working as for tks, sl st across 2 sts, tks across, close, leaving rem sts unworked—40 (46, 52, 58, 64) lps. Row 1: 4 (7, 9, 10, 13) tks, work end dec, close, leaving rem sts unworked—6 (9, 11, 12, 15) lps. Row 2: Tks to last 3 sts, work end dec, tks, close—5 (8, 10, 11, 14) lps. Row 17: Ch 1, pull up lp in 2nd ch from hook, tks in each st across, close—7 (10, 12, 13, 14) lps. Rows 18-20: Rep row 17. On final row—13 (16, 18, 19, 20) lps. Do not cut off. Ch 11, remove last ch from hook, remove stitch holder from prev Side of Back, place unclosed lps on hook, replace ch on hook, without twisting back or length of ch, close rem sts. Do not cut off. Note: On next row the joining chain will produce one extra stitch. Although there are 11 chs, it really is an increase of 12 sts. Row 1: Tks to joining chain—13 (16, 18, 19, 20) lps on hook, pull up a lp in each ch—12 (12, 12, 12, 12) more lps on hook, tks across—13 (16, 18, 19, 20) more lps on hook, close—38 (44, 48, 50, 52) lps. Row 2: Tks across, close. Rep prev row 1 (4, 6, 8, 10) times more. Note: The back has 3 fewer rows than the fronts. The fronts form the front and back of the shoulder. Row 1: Returning to rem 27 (30, 34, 39, 42) sts of Center Back Motif shaping, pull up lp in first unworked st, working as for tks, sl st across 6 (6, 8, 10, 12) sts (1 lp rem on hook), work beg dec, tks to last 3 sts, work end dec, tks, close—19 (22, 24, 27, 28) lps. Row 6: Tks to last 3 sts, work end dec, close—14 (17, 19, 22, 23) lps. With yarn needle and B, seam shoulders, matching st for st to Back. 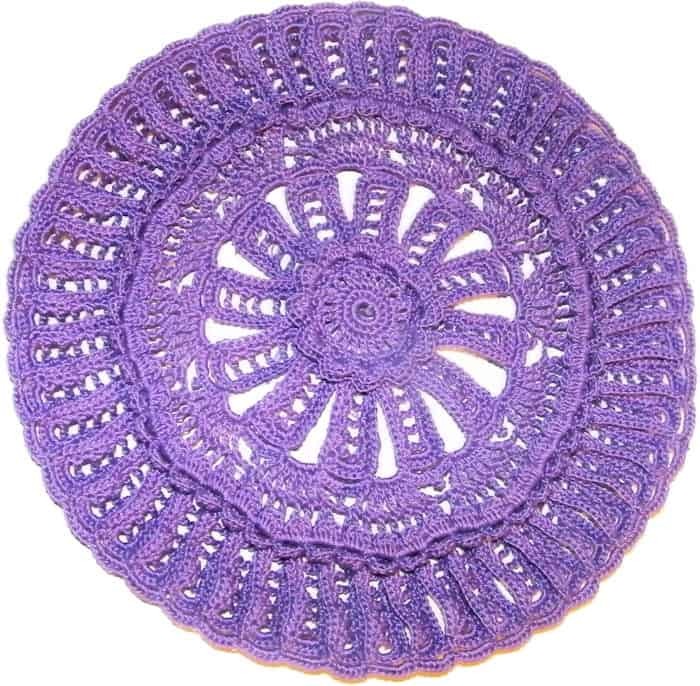 Rnd 1: With regular crochet hook, join B with sl st to any position in the inside circle remaining for Center Back Motif, ch 1, sc evenly around, sl st to first sc. Rnd 2: Ch 1, sc around, sl st to first sc, cut off. With RS facing you, place Center Back Motif with rnd 25 overlapping Center Back Preparation. Carefully pin in place. With sewing needle and A, sew into place. Rnd 1: With regular crochet hook, join B with sl st to bottom of armhole, ch 1, sc evenly around, sl st to first sc. Rep rnds 1-2 for opposite Armhole. Row 1: With RS facing, with afghan hook and B, working along inner edges and back neck, pick up a lp in side of each row and in each st of back neck, close. Row 2: [Tks, trs] across. If a st remains, tks in last st, close. Note: Not knowing whether someone will have an even or odd number here, I’ve included the “if a st remains” language. It would be possible to get exact amounts, but I didn’t want to make this more difficult than necessary. If you’d like an exact number of stitches for row 1, let me know. Row 3: With stitch marker (or small piece of scrap yarn), mark a buttonhole position approx 8 (8.5, 9.25, 10, 10.75)” from hem, measuring along the Button Band. [Trs, tks] across to buttonhole position, working as for tks, sl st across 2 sts, [trs, tks] across rem sts. If a st remains, trs in last st, close normally, except at buttonhole position, ch 1. Row 4: Rep row 2, except at buttonhole position, pull up 2 lps in chs, close. Row 5: Working as for tks, sl st across each st, cut off. Work in a spiral; there is no sl st at the end of a rnd and no ch 1 at the beg of a rnd. Mark the beg of each rnd with stitch marker (or small piece of scrap yarn). Rnd 1: With regular crochet hook and B, ch 2, 4 sc in 2nd ch from hook. Rnd 2: 2 sc in each sc around—8 sc. Rnd 3: 2 sc in each sc around—16 sc. Rnd 4: Hold 1.5” plastic ring to back of work and working into sts and around ring simultaneously, *sc in sc, 2 sc in next sc, rep from * around, sl st to first sc—32 sc. Cut off leaving 10”. Using yarn needle and 10” length, insert needle into top lps of one of the sc from the last rnd, bring it across the back of the work and insert into the top lps of the sc across from it, cinching tightly. Continue to create cinching strands across the back in about 4 or 5 alternate positions, once tight and the tops of all sc have rotated to the back of the Button, cut off. Block as desired. Weave in all ends. Attach Button across from buttonhole. Designer Note: This pattern was originally published in Interweave Crochet, Winter 2013. 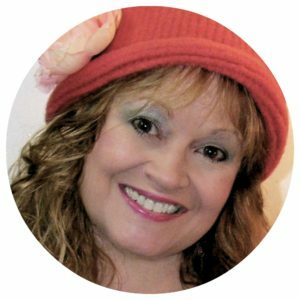 Although I sold first rights of publication to Interweave, I retain the right to publish and this is an excerpt of the pattern from the magazine. I’ve included the first two sizes only. 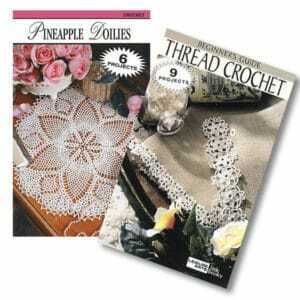 The original Interweave pattern includes sizes 33 (35, 38, 41, 44)”. If you would like to purchase the pattern in its entirety, it is available HERE. Superwash merino has been chosen for this project because, upon wet-blocking and allowing to dry, the stitches open up beautifully and this method of blocking alleviates any curling of the fabric you may experience. Skip first vertical bar at beginning of each row. The 1 loop remaining from the previous row counts as the first stitch throughout. Unless otherwise indicated, to “close” stitches means to work as follows for the indicated sts: ch 1, [yarn over, pull through 2 loops] across. When indicated to place marker (pm), leave stitch marker (sm) in place until it is indicated to place marker again. To decrease (dec), insert hook in 2 stitches simultaneously, yarn over, pull through both stitches. When working decrease into ttwps, work as for ttwps. When working decrease into tks, work as for tks. To increase (inc), pull up a lp in both the back and the front of the indicated st.
To bind off (bo), sl st in indicated sts. Tunisian Knit Stitch (tks): Insert hook, from front of work to back of work, between the front and back vertical bars of the same stitch, yarn over, pull a loop through. Note: Left-handers will get the opposite of right- and left-leaning cables when following these instructions. Reverse rlc with llc and llc with rlc to get a true representation of the design. Right-Leaning Cable (rlc): pull up on first lp on hook (working lp) and carefully remove it, grip 6 sts with your non-hook hand, pull slightly on hook to loosen sts, while still gripping the stitches, carefully remove the 6 stitches from the hook, place cable holder in 4th, 5th and 6th st, drop cable holder to the back of work, place 1st, 2nd and 3rd st back on hook, then place the 3 sts from the cable holder on the hook, replace working lp back on hook. To close: [yo, pull through 2 lps on hook] 3 times, ch 1, [yo, pull through 2 lps on hook] 3 times. In all subsequent rows, always place a ch 1 at the center of each 6-st cable. Left-leaning Cable (llc): repeat as for rlc, except drop cable holder to the front of work. Ribbing (rib): [2 tks, 2 trs] across, repeat for subsequent ribbing rows. Rows 1-4: [12 tks, 4 (6) twps] to last 12 sts, 12 tks. Row 5: [12 tks, 4 (6) twps] to last 12 sts, 12 tks. At closing, *rlc (see Cables above), llc, [yo, pull through 2 lps] 4 (6) times, llc, rlc, [yo, pull through 2 lps] 4 (6) times, rep from * to last 12 tks, rlc, llc. Row 6-9: Rep rows 1-4, except work ch-1 in center of each 6-st cable. Row 10: [12 tks, 4 (6) twps] to last 12 sts, 12 tks. At closing, *llc, rlc, [yo, pull through 2 lps] 4 (6) times, rlc, llc, [yo, pull through 2 lps] 4 (6) times, rep from * to last 12 tks, llc, rlc. Rows 11-14: Rep rows 6-9. Row 15-19: Rep rows 10-14. Row 20-29: Rep rows 5-9 twice. Rep rows 10-29 for pattern. Row 1: With smaller hook, ch 192 (212), insert hook in second ch from hook, yo, pull lp through, [insert hook in next ch, yo, pull lp through] across: 192 (212) sts. Close (see Notes above). Row 2: Rib (see Stitch Patterns above) to last st, tks in last st: 192 (212) sts. Close. Rows 3-10: Rep row 2. Row 1: With larger hook, rib 5 sts, 4 ttwps, pm #1, work in cable (see Stitch Patterns above) to last 10 sts, pm #2, 4 ttwps, rib 5 sts, tks in last st: 192 (212) sts, 11 (11) cable sections. Close. Rows 2-4: Rep row 1. Row 6: Rib 5 sts, 2 ttwps, dec, pm #1, work in cable to sm, pm #2, dec, 2 ttwps, rib 5 sts, tks in last st: 190 (210) sts. Close. Row 7: Rib 5 sts, 3 ttwps, pm #1, work in cable to sm, pm #2, 3 ttwps, rib 5 sts, tks in last st. Close. Rows 8-10: Rep row 7. Row 11: Rib 5 sts, ttwps, dec, pm #1, work in cable to sm, pm #2, ttwps, dec, rib 5 sts, tks in last st: 188 (208) sts. Close. Row 12: Rib 5 sts, 2 ttwps, pm #1, work in cable to sm, pm #2, 2 ttwps, rib 5 sts, tks in last st. Close. Rows 13-15: Rep row 12. Row 16: Rib 5 sts, dec, pm #1, work in cable to sm, pm #2, dec, rib 5 sts, tks in last st: 186 (206) sts. Close. Row 17: Rib 5 sts, ttwps, pm #1, work in cable to sm, pm #2, ttwps, rib 5 sts, tks in last st. Close. Rows 18-20: Rep row 17. Row 21: Rib 4 sts, dec as for ttwps, pm #1, work in cable to sm, pm #2, dec as for tks, rib 4 sts, tks in last st: 184 (204) sts. Close. Row 22: Rib 5 sts, 12 tks, 4 ttwps, pm #1, work in cable to last 22 sts, pm #2, 4 ttwps, 12 tks, rib 5 sts, tks in last st. Close. Row 23: Rib 5 sts, 12 tks, 4 ttwps, pm #1, work in cable to sm, pm #2, 4 ttwps, 12 tks, rib 5 sts, tks in last st. Close. Rows 24-25: Rep row 23. Row 26: Rib 5 sts, dec, 10 tks, 4 ttwps, pm #1, work in cable to sm, pm #2, 4 ttwps, 10 tks, dec, rib 5 sts, tks in last st: 182 (202) sts. Close. Row 27: Rib 5 sts, 11 tks, 4 ttwps, pm #1, work in cable to sm, pm #2, 4 ttwps, 11 tks, rib 5 sts, tks in last st. Close. Rows 28-30: Rep row 22. Row 31: Rib 5 sts, dec, 9 tks, 4 ttwps, pm #1, work in cable to sm, pm #2, 4 ttwps, 9 tks, dec, rib 5 sts, tks in last st: 180 (200) sts. Close. Row 32: Rib 5 sts, ttwps, 9 tks, 4 ttwps, pm #1, work in cable to sm, pm #2, 4 ttwps, 9 tks, ttwps, rib 5 sts, tks in last st. Close. Row 33: Rib 5 sts, 2 ttwps, 8 tks, 4 ttwps, pm #1, work in cable to sm, pm #2, 4 ttwps, 8 tks, 2 ttwps, rib 5 sts, tks in last st. Close. Row 34: Rib 5 sts, 3 ttwps, 7 tks, 4 ttwps, pm #1, work in cable to sm, pm #2, 4 ttwps, 7 tks, 3 ttwps, rib 5 sts, tks in last st. Close. Row 35: Rib 5 sts, 4 ttwps, 6 tks, 4 ttwps, pm #1, work in cable to sm, pm #2, 4 ttwps, 6 tks, 4 ttwps, rib 5 sts, tks in last st. Close. Row 36: Rib 5 sts, 5 ttwps, dec, 3 tks, 4 ttwps, pm #1, work in cable to sm, pm #2, 4 ttwps, 3 tks, dec, 5 ttwps, rib 5 sts, tks in last st: 178 (198) sts. Close. Row 37: Rib 5 sts, 6 ttwps, 3 tks, 4 ttwps, pm #1, work in cable to sm, pm #2, 4 ttwps, 3 tks, 6 ttwps, rib 5 sts, tks in last st. Close. Row 38: Rib 5 sts, 7 ttwps, 2 tks, 4 ttwps, pm #1, work in cable to sm, pm #2, 4 ttwps, 2 tks, 7 ttwps, rib 5 sts, tks in last st. Close. Row 39: Rib 5 sts, 8 ttwps, tks, 4 ttwps, pm #1, work in cable to sm, pm #2, 4 ttwps, tks, 8 ttwps, rib 5 sts, tks in last st. Close. Row 40: Rib 5 sts, 13 ttwps, pm #1, work in cable to sm, pm #2, 13 ttwps, rib 5 sts, tks in last st. Close. Row 41: Rib 5 sts, dec, 11 ttwps, pm #1, work in cable to sm, pm #2, 11 ttwps, dec, rib 5 sts, tks in last st: 176 (196) sts. Close. Row 42: Rib 5 sts, 12 ttwps, pm #1, work in cable to sm, pm #2, 12 ttwps, rib 5 sts, tks in last st. Close. Rows 43-45: Rep row 42. Row 46: Rib 5 sts, dec, 10 ttwps, pm #1, work in cable to sm, pm #2, 10 ttwps, dec, rib 5 sts, tks in last st: 174 (194) sts. Close. Row 47: Rib 5 sts, 11 ttwps, pm #1, work in cable to sm, pm #2, 11 ttwps, dec, rib 5 sts, tks in last st. Close. Rows 48-59: Rep row 47. Remove stitch markers. Row 1: Rib 5 sts, 11 ttwps, 24 (28) tks: 41 (45) sts. Close, leaving rem sts unworked. Row 2: Rib 5 sts, 11 ttwps, tks to last 3 sts, dec, tks in last st: 40 (44) sts. Close. Note: Buttonholes are worked simultaneously on this front for right-handers and opposite front for left-handers. Buttonholes begin on row 3. At rib, work 2 sts, bo 2 sts, then cont across as instructed. At close, work 2 ch over buttonhole position. Maintain rib patt when working into chs of buttonhole. After first buttonhole, work buttonhole on every 7th (7th) row. Rep row 2 until 11 (12) rows completed for First Front Bodice. On final row, 31 (34) sts. Next row: Rib 5 sts, 11 ttwps, tks across. Close. Rep prev row until 25 (25) rows completed for bodice. Next row: Bo 12 (14) sts, cont in established patt across: 19 (20) sts. Close. Next 4 rows: Dec, cont in established patt across. Close. On final row, 15 (16) sts. Cont in established patt with no decreasing for 0 (2) more rows. Bo across, fasten off. Row 2: Dec, tks to sm, pm #1, work in cable to sm, pm #2, tks to last 3 sts, dec, tks in last st: 80 (88) sts. Close. Row 3: Rep row 2: 78 (86) sts. Rep prev row until 9 (10) rows completed for back. On final row, 66 (74) sts. Row 10 (11): Tks to sm, pm #1, work in cable to sm, pm #2, tks across. Close. Rep prev row until 25 (25), rows completed for back. Bo all sts, fasten off, remove stitch markers. Next 5 (7) rows: Rep row 10, except discontinue crossing cables and discontinue ch-1 in center of cables. Row 1: On row 59 of body, join with sl st to first unworked st, ch 1, bo 5 (7) sts (1 lp on hook), 23 (27) tks, 11 ttwps, rib 5 sts, tks in last st: 41 (45) sts. Close. Row 2: Dec, 21 (25) tks, 11 ttwps, rib 5 sts, tks in last st: 40 (44) sts. Close. Note: If left-handed, follow buttonhole instructions of First Front Bodice. Rep row 2 until 11 (12) rows completed for Second Front Bodice. On final row, 31 (34) sts. Next row: 13 (14) tks, 11 ttwps, rib 5 sts, tks in last st. Close. Next row: Cont in established patt to last 11 (13) sts, bo across, fasten off: 19 (20) sts. With new strand of yarn, close all sts. Next 4 rows: Cont in established patt to last 3 sts, dec, tks in last st. Close. On final row, 15 (16) sts. Row 1: With smaller hook, 60 (62), insert hook in second ch from, yo, pull lp through, [insert hook in next ch, yo, pull lp through] across: 60 (62) sts. Close. Row 2: Rib to last st, tks in last st: 60 (62) sts. Close. Row 1: With larger hook, inc, 18 (19) tks, 4 ttwps, pm #1, work in cable across 12 sts only, pm #2, 4 ttwps, tks to last 2 sts, inc, tks in last st: 62 (64) sts. Close. Row 2: Inc, tks to 4 sts before sm, 4 ttwps, pm #1, work in cable to sm, pm #2, 4 ttwps, tks to last 2 sts, inc, tks in last st: 64 (66) sts. Close. Rep row 2 until 4 (3) rows completed for Body. On final row, 68 (68) sts. Move stitch markers up as work progresses here and throughout. Next 2 rows: Tks to 4 sts before sm, 4 ttwps, pm #1, work in cable to sm, pm #2, 4 ttwps, tks across. Close. Next row: Inc, tks to 4 sts before sm, 4 ttwps, pm #1, work in cable to sm, pm #2, 4 ttwps, tks to last 2 sts, inc, tks in last st: 70 (70) sts. Close. Rep prev 3 rows until 19 (17) rows completed for Body. On final row, 78 (78) sts. Work without increasing 1 (3) more rows. Row 1: Bo 3 (4) sts (1 lp rem on hook), tks to 4 sts before sm, 4 ttwps, pm #1, work in cable to sm, pm #2, 4 ttwps, tks to last 2 (3) sts, bo 2 (3) sts: 72 (70) sts. Close. Row 2: Dec, tks to 4 sts before sm, 4 ttwps, pm #1, work in cable to sm, pm #2, 4 ttwps, tks to last 3 sts, dec, tks in last st: 70 (68) sts. Close. Rep row 2 until 18 (14) rows completed for Sleeve Cap. On final row, 38 (44) sts. Next row: Tks to 4 sts before sm, 4 ttwps, pm #1, work in cable to sm, pm #2, 4 ttwps, tks across. Close. Next row: Rep row 2: 36 (42) sts. Rep prev 2 rows until 30 (32) rows completed for Sleeve Cap. On final row, 26 sts. Row 1: 4 tks, 4 ttwps, pm #4, work in cable to sm, pm #2, 4 ttwps, 5 tks: 26 sts. Close. Rep row 1 until 10 (13) rows completed for Saddle Shoulder. Rep row 1, except discontinue crossing cables and discontinue ch-1 in center of cables, until 15 (16) rows completed for Saddle Shoulder. Bo, fasten off. Before assembly, block all pieces as follows: Completely immerse in cool water, remove excess water, roll in dry towel to remove as much water as possible, lie flat and shape, allow to dry completely. With yarn needle, seam sleeve cap to sleeve opening, matching stitch for stitch, seam saddle shoulder to tops of fronts and back, seam sleeve. Row 2: [ttwps, tks] 4 times, insert hook in next st of garment neckline, yo, pull lp through: 10 sts, [yo, pull through 2 lps on hook] across. Row 3: [ttwps, tks] 2 times, bo 2, cont rib across, join in next st of garment neckline, [yo, pull through 2 lps on hook] across, except ch 2 at buttonhole position. Row 4: Cont in rib st patt, joining each row to next st/row until entire neck trim is complete. Bo, fasten off, weave in all ends. With yarn needle, weave in all ends securely. With sewing needle and coordinating sewing thread, attach buttons adjacent to button hole positions.